At Subaru, environmental friendliness is a top priority, therefore they have created online digital brochures that can be downloaded and viewed right from your computer. These brochures offer information about all the new Subaru models, offering you a great resource to learn all about the Subaru you are thinking of purchasing. We currently have 2016 Subaru Brochures for the Subaru Legacy, Subaru Outback, Subaru Forester, Subaru Impreza, Subaru WRX/STi, Subaru BRZ, and the Subaru XV Crosstrek. Each brochure offers a quick overview of the vehicle, as well as the detailed specifications. After researching and finding the Subaru that fits your lifestyle, be sure to check our New Vehicle Inventory to see all the great prices on New Subarus that Tucson Subaru has to offer. Using the listing below, you can download and find useful information, details, and specifications of each previous model year's trim levels, safety features, performance, and technology. At Tucson Subaru, we want to make sure that you have all the information you are looking for when looking to purchase a new Subaru Vehicle to ensure that you choose the vehicle you'll want to keep driving for years to come. Looking for Genuine Subaru Accessories for your 2014 Subaru Car or SUV? Tucson Subaru has a full inventory of Popular Subaru Accessories that are designed specifically for your Subaru Model Vehicle. Also, keep up with your Subaru's regular maintenance plan by making use of Tucson Subaru's Service Specials, and Parts Discount Coupons that help make your car repair & maintenance less of a burden on your wallet. 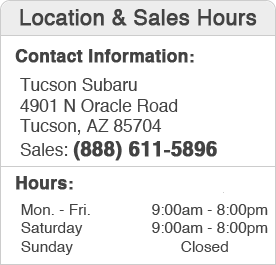 We care about your Subaru just as much as you do, let us prove it to you by visiting our dealership at 4901 N Oracle Rd Tucson, AZ 85704, where you will receive excellent customer service to make you feel right at home!